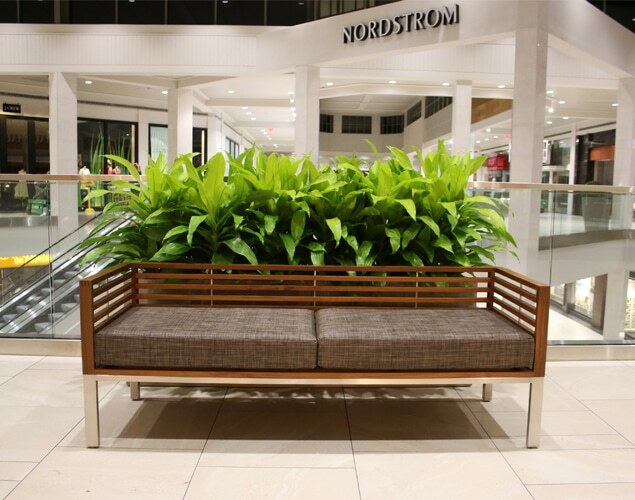 National Program - Blondie's Treehouse, Inc.
Blondie’s National Program has recently installed a interiorscape design at an upscale shopping mall located in the suburbs of Minneapolis, MN. 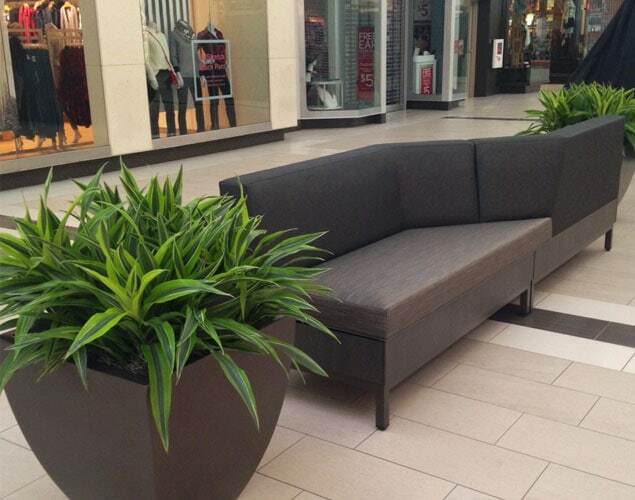 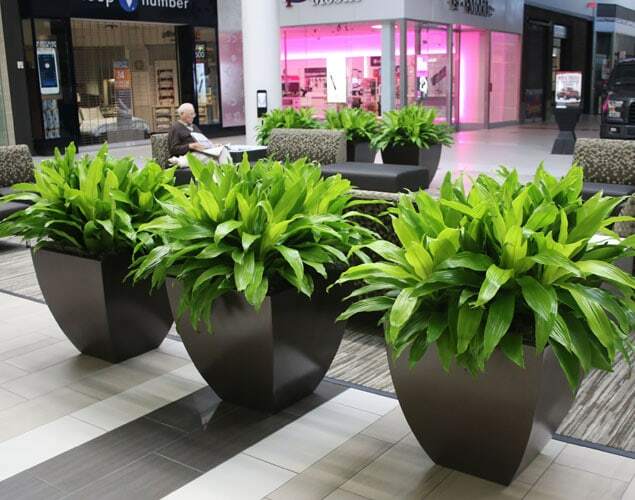 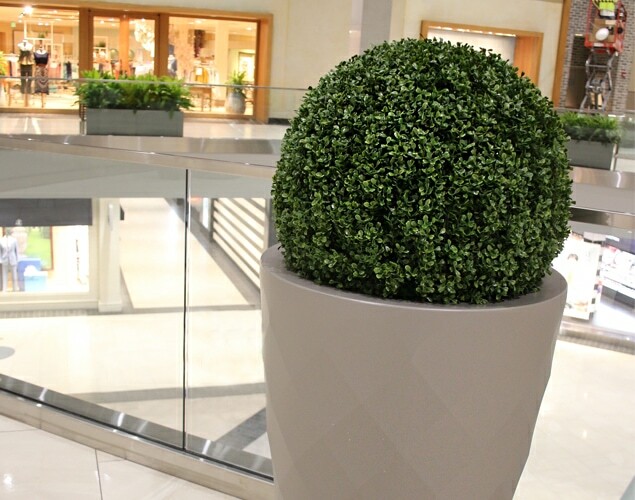 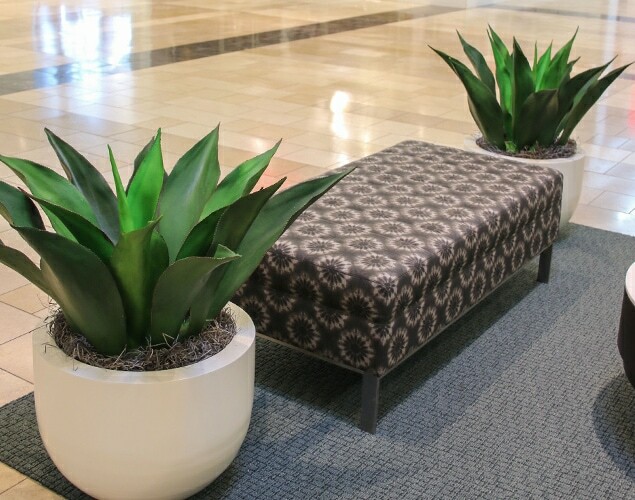 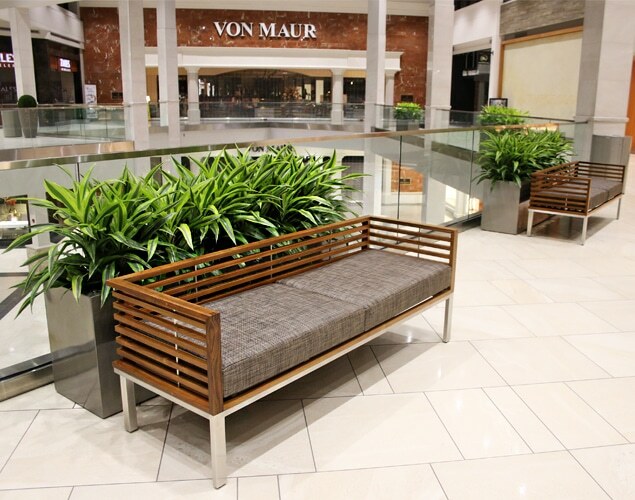 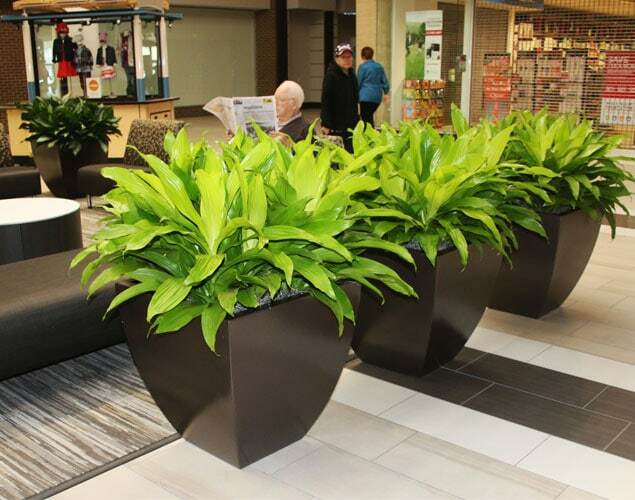 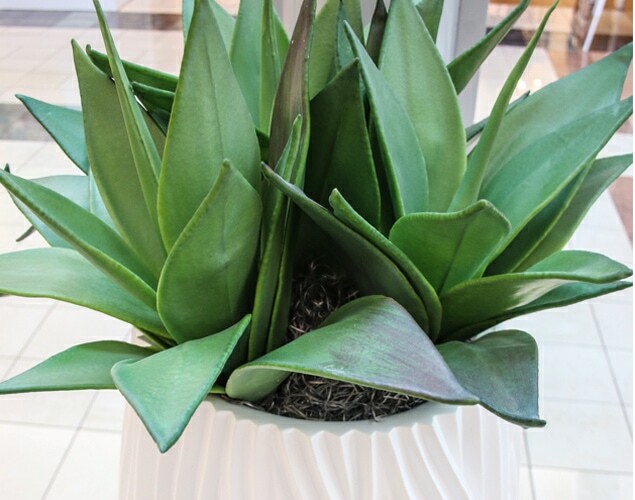 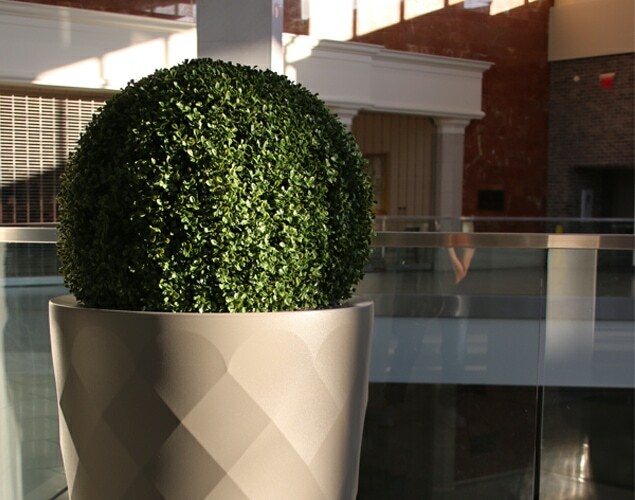 44 new Fiberglass Decorative Tapered Square Planters were placed throughout the mall, all with a coordinating bronze finish and 175 live plants in such varieties as Dracaena Limelight, Dracaena Lemon-Lime and Aglaonema Silver-Bay were brought in and placed in groupings for a cohesive and streamlined design. 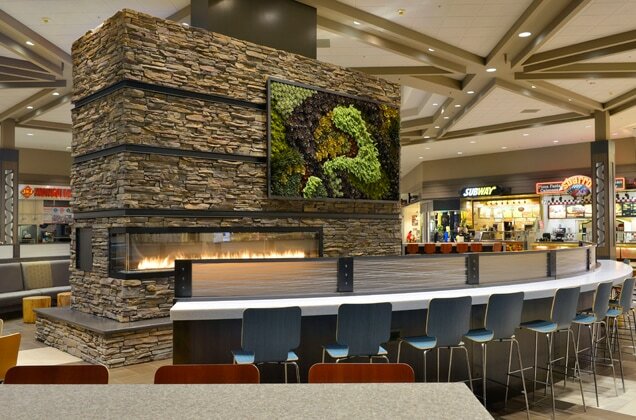 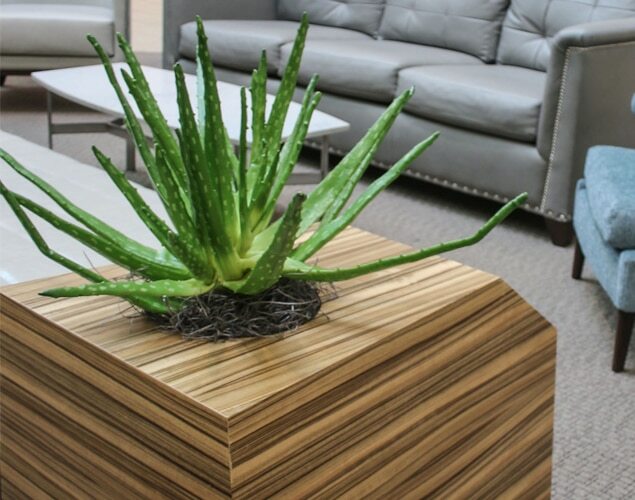 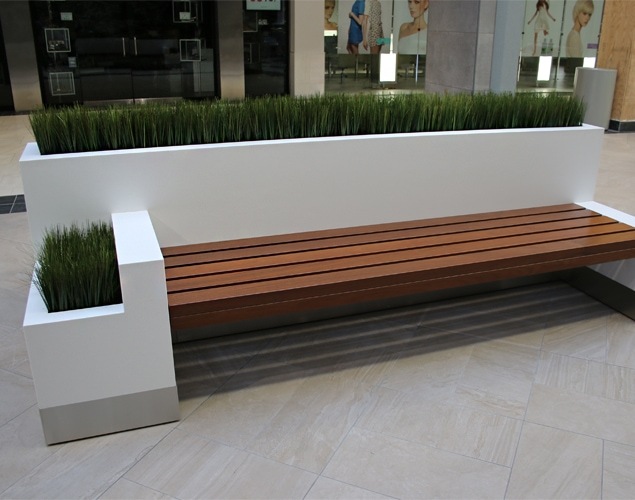 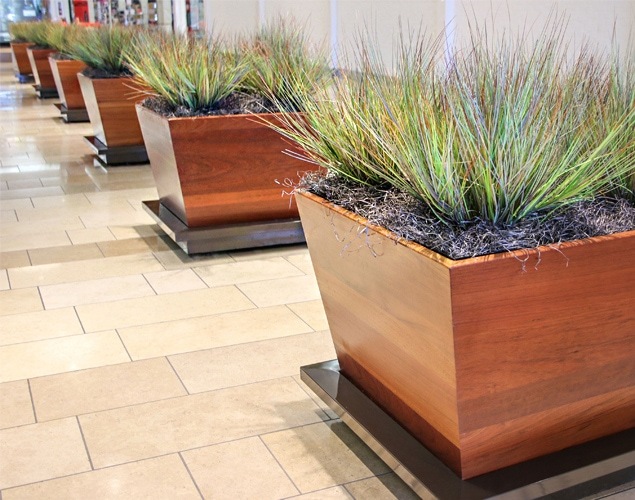 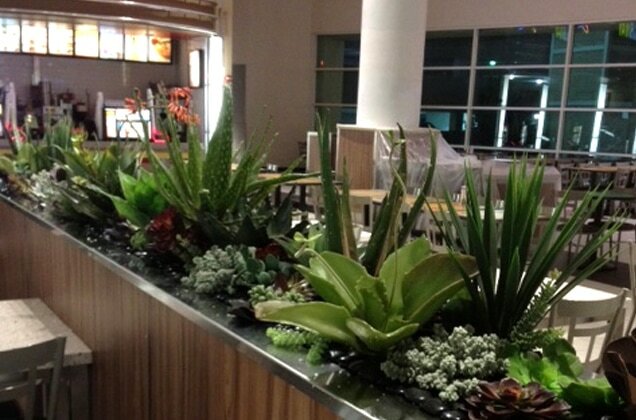 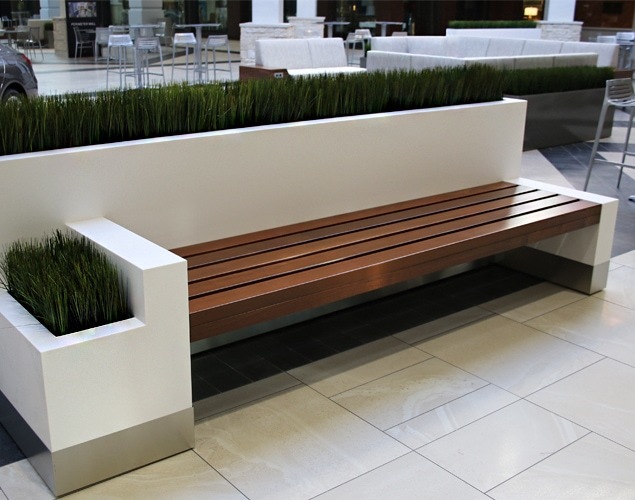 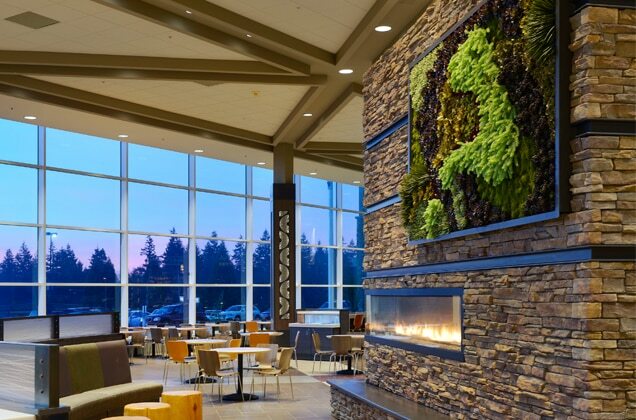 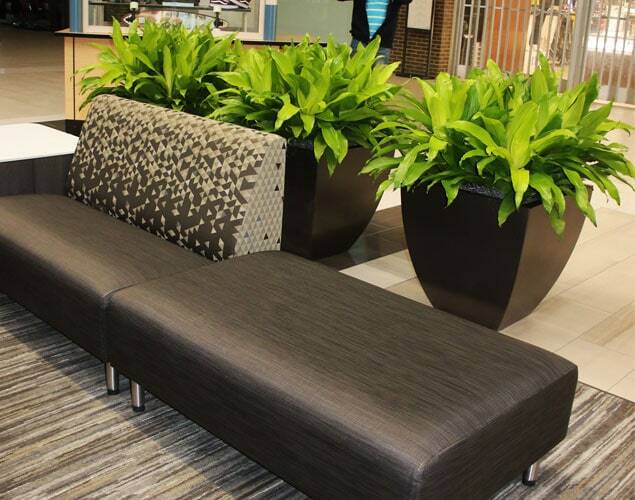 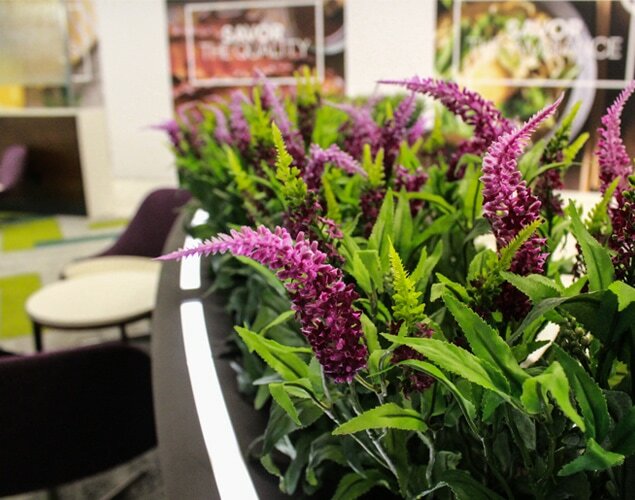 21 custom planter inserts for the Food Court were fitted with over 215 Square Feet of 18″ Preserved Prairie Grass. 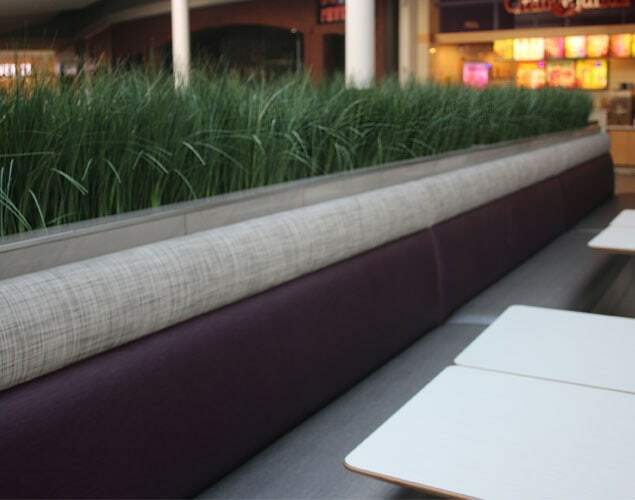 The grasses were selectively hand-pruned after the installation to insure that the grasses did not flop over or impede on diners. 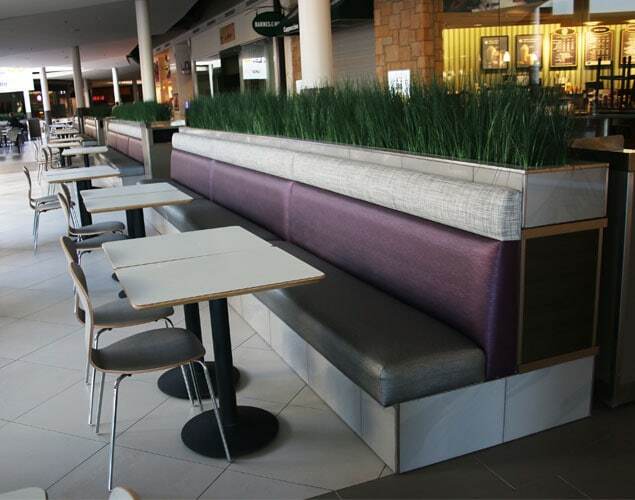 The overall effect is a simple, clean design that unifies the food court, providing both privacy and aesthetic appeal. 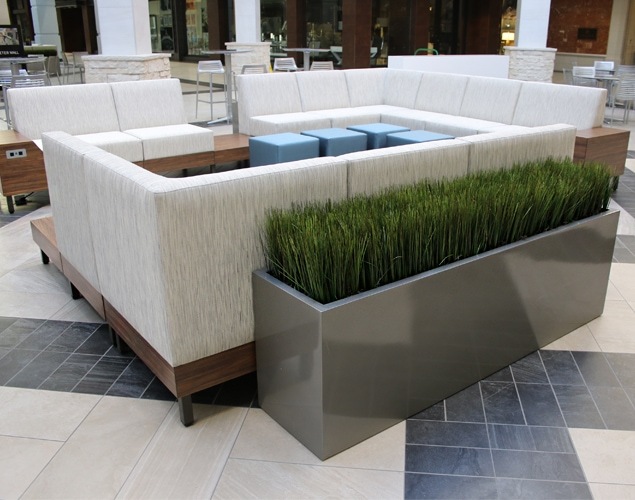 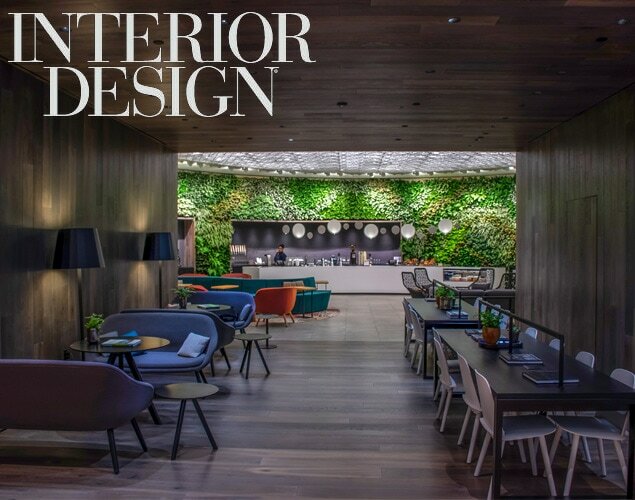 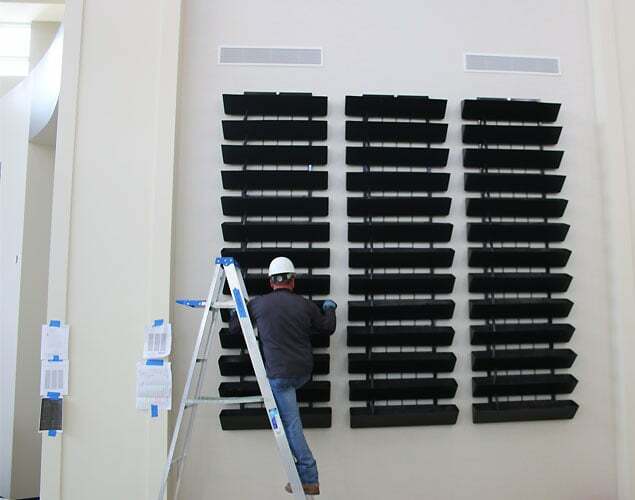 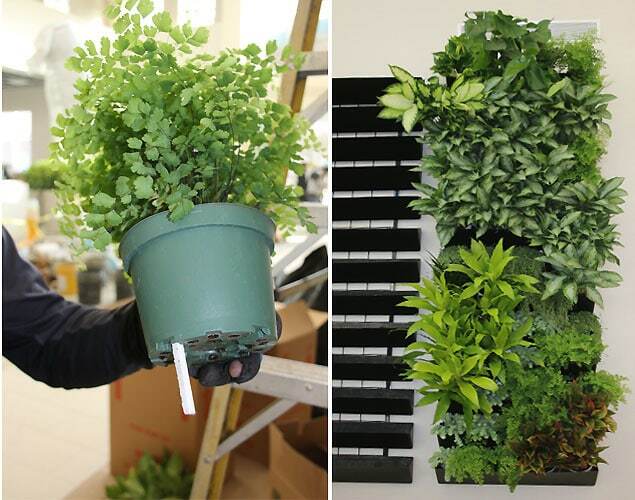 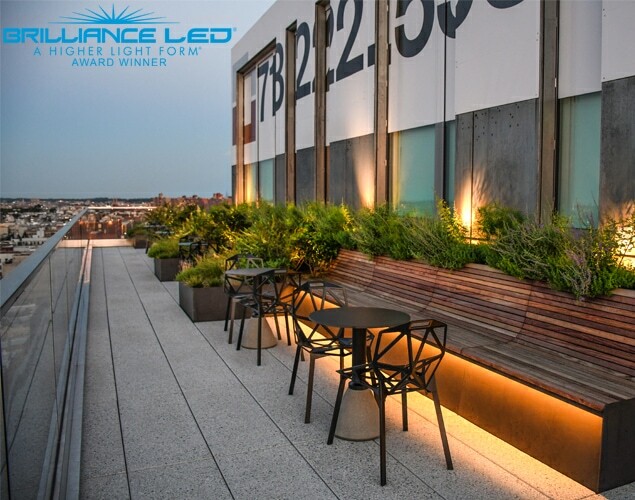 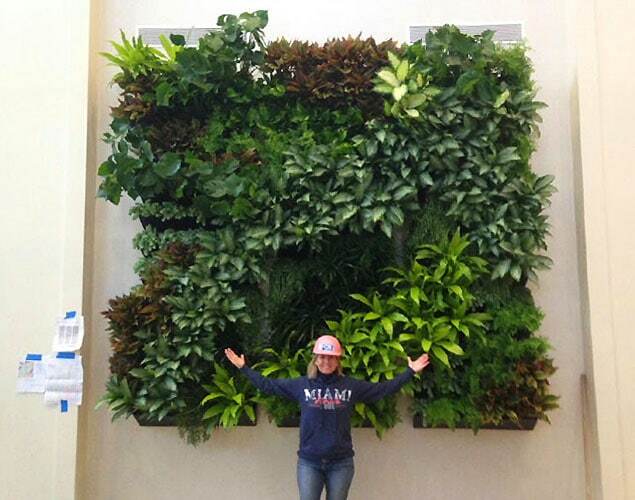 For this Greenwall installation Blondie’s designer and national account developer Daria Snyder selected a trough system that attaches to a grid structure. 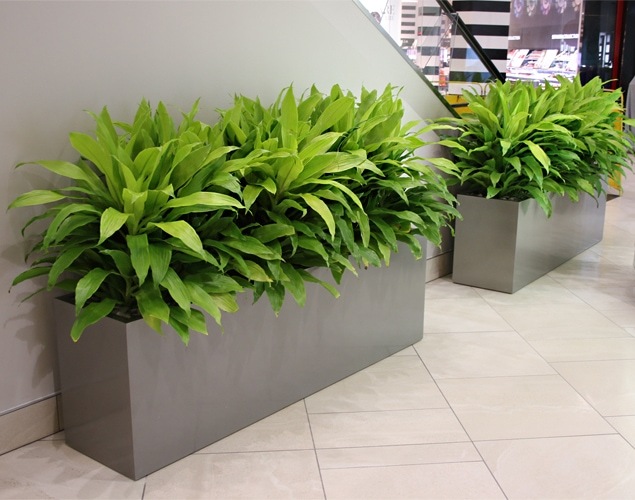 Because of this wall’s high visibility, its planter trays that hold 6” plant material, can easily be planted or are accessed easily for plant replacement assuring ease of maintenance and seasonal rotations. 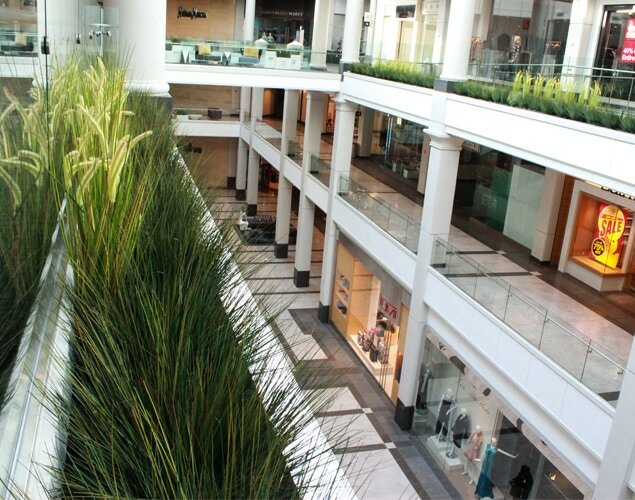 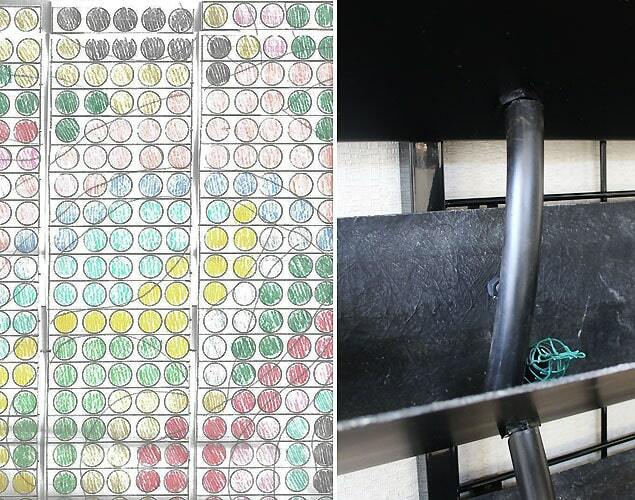 This system relies on water wicking technology which has long been a successful method for regulating and extending watering cycles in a commercial environment. 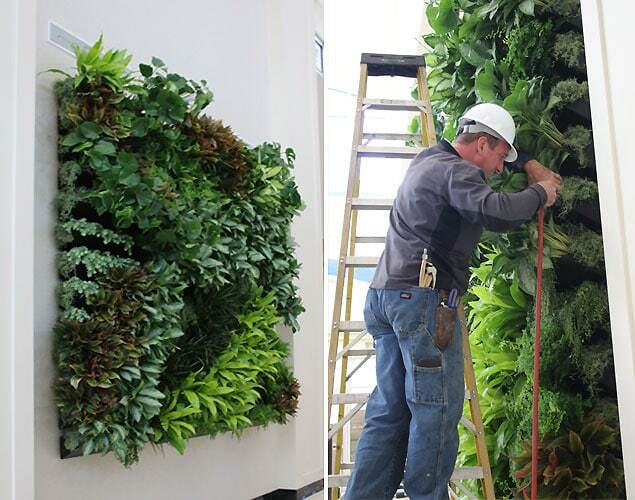 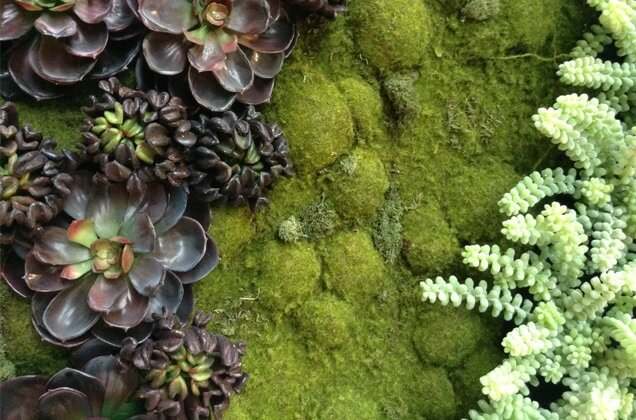 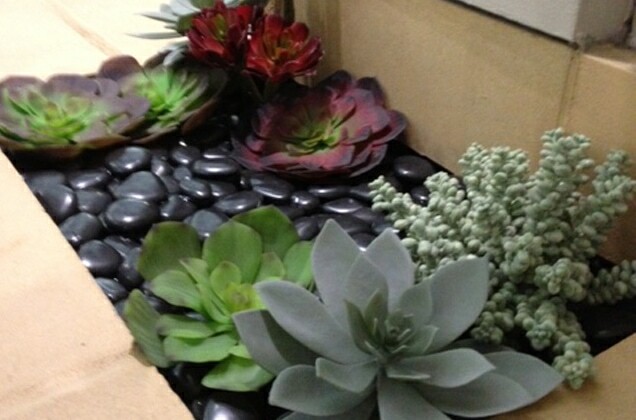 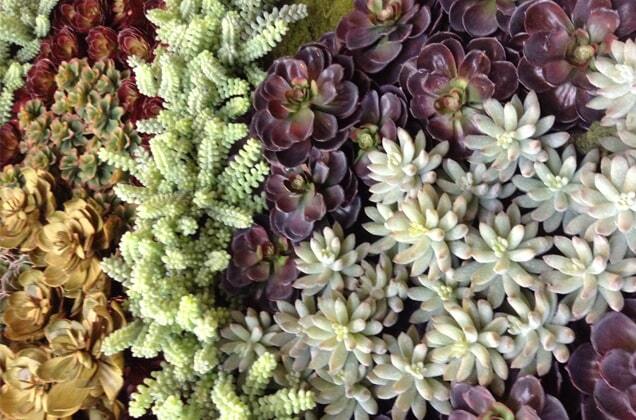 The walls dimension is 10’ H x 10’ W and incorporates approximately 200 6” plants. 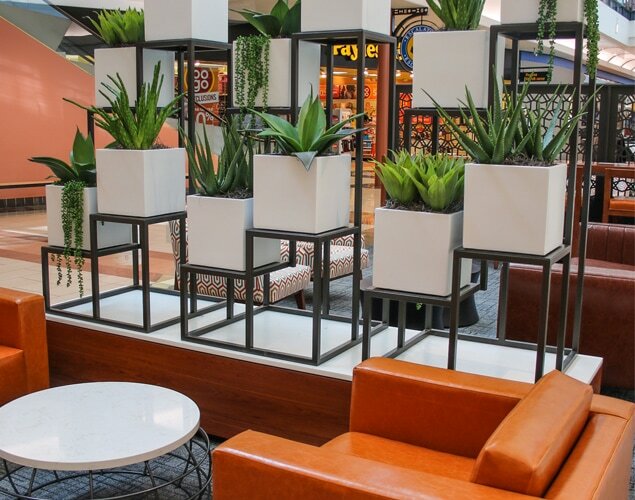 The plant palette was custom selected for the site’s location and relies on the contrast of color and texture of the plant material. 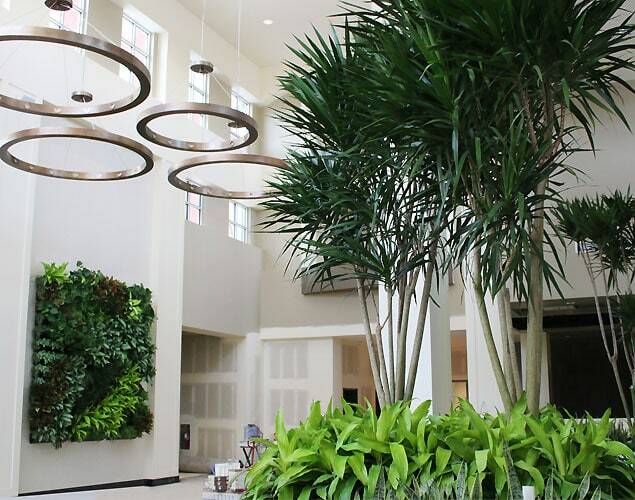 This project highlights Blondie’s National Account Program and how it is set up to seamlessly function and manage national and international projects. 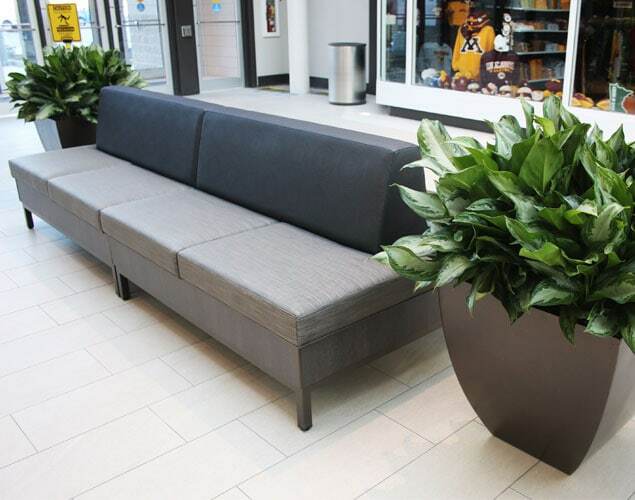 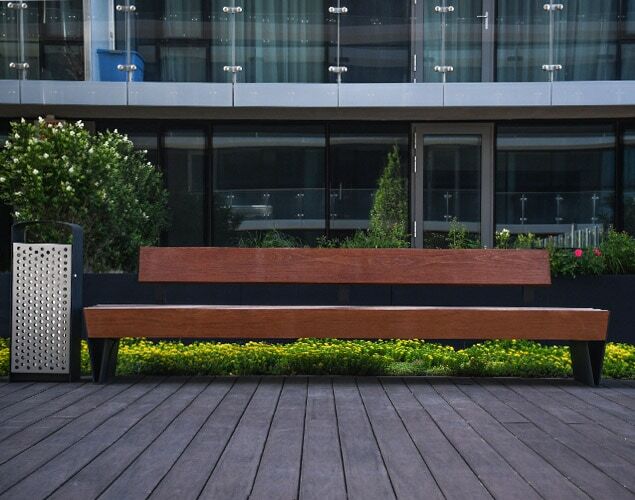 After developing a design program with the client, we build a team of regional specialists and a local plantscaping company is brought onto the project and trained to assist in the installation and on-going maintenance of the project. 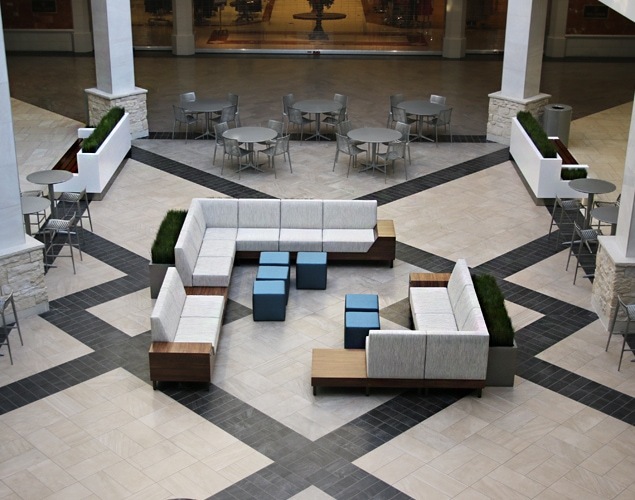 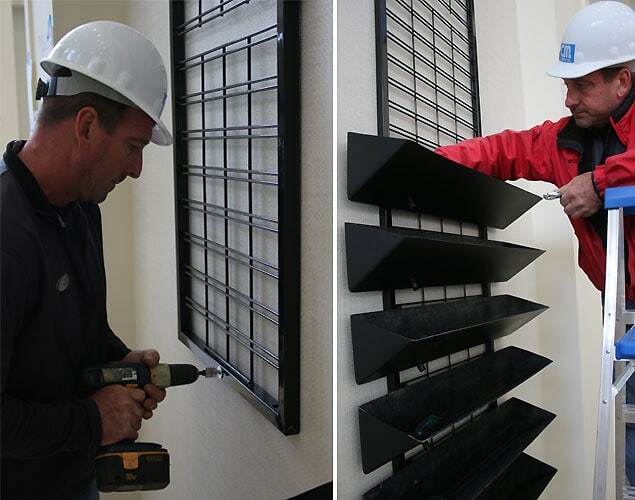 By staying on as a project consultant, Blondie’s is able to monitor the quality and success of the installation and is a consistent presence in managing the project. 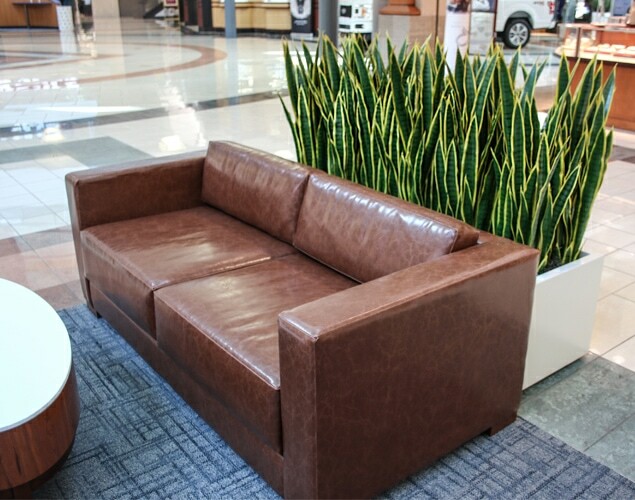 With this type of hands on approach Blondie’s is able to offer custom high quality designs for multi-location and international brands.